The Agility Weave is probably one of the most difficult obstacles that your dog will need to learn in order to score well in agility contests. Similar to a slalom, the weave is comprised of a series of 5 to 12 poles, each approximately 1 yard tall and spaced approximately 20 inches apart. It is through this 20 inch gap that your dog will “weave” in and out of the poles. All dogs must enter the agility weave with the first pole to their left and cannot skip poles. You can begin training your dog as early as you want. Start by placing two rows of poles approximately 20 inches apart from each other. The goal is to create a path for the dog to run through. Then play with your dog. Throw their favorite ball or toy through the agility weave and allow them to run through it to retrieve the toy and bring it back to you. This will get your dog used to moving through a space which is more confined than they are used to. Training techniques for the weave vary but now is a good time to bring up a technique you need to stay away from at all costs: wire weave training. This involves creating a path using wire to train the dog to correctly navigate the weave poles. While it seems logical it can cause tremendous physical and mental harm to your dog especially when the dog runs at the agility weave at full speed. Trust me on this one, I’ve seen it happen and it was devastating to both dog and owner. Once they are used to this you can use a motivator like their favorite toy or a special treat to begin to teach them to weave in and out of the poles. Here is a fabulous video which shows a safe way to train your pet to begin to weave the poles. It is always so much fun to see just how motivated your dog can become when you really begin to gain confidence while doing the agility weave! Some dogs will pick up on this faster than others. So, how do you speed your dog up? You practice practice practice. The more practice you do, the faster your dog will get and the more confident they will be. The best agility dogs in the world have a super high confidence level when performing the agility weave. They get out on the course and they fly through every obstacle. Why? Because they have gone through this dog and pony routine so many times before that it is like second nature to them now. There are many great DVD’s out there that can help you teach your dog how to weave and how to increase their speed through the poles. I’ve listed a few below in case you find you need some extra help. 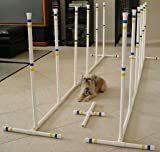 Agility Fix It DVD – Contacts And Weave Poles. Now get out there and practice, practice practice! If you are thinking about beginning to train your dog to be the next agility superstar, you are going to need some basic agility training equipment and some basic obedience training first. Before you begin training your dog there are a few things your dog will need to master before you begin. – Your dog needs to be at least 9 months old. – Your dog needs to get along well with other dogs and be well socialized. – Your dog needs to know these basic commands and do them on command: stay, sit, down and come. – Your dog needs to be capable of walking on a leash loosely. Tuggers need not apply. There are reasons these requirements are in place. Dog agility is a fast paced sport and many dogs can become over-excited during training and competitions. It is essential that you have control over your dog at all times. In fact, showing that control is part of the agility training course as you will find out. If you think your dog is ready you can sign up for an beginner agility training class. These classes will typically have the basic agility training equipment and class sizes range from 10-25 people. The number of instructors in each class will vary depending upon the number of participants. Normally there is a 1:6 ratio; 1 teacher for every 6 dogs. The first class you can expect your dog to be matched up with other dogs of similar breed/size. These dog agility classes can last anywhere from 6 – 15 weeks. So, before you sign up you need to determine how much time you are willing / able to commit to training your dog. Remember, your dog will have homework to practice too so work that time into your schedule as well. – A 6 foot lead and collar for your dog. Once you begin your classes you will probably want to purchase specific pieces of agility training equipment in order to practice with your dog at home. Probably one of the first pieces you will need will be a Teeter. This is simply a flat board which has the yellow markings (contact areas) which dogs walk on and it moves up and down like a teeter totter. This skill is vital for dogs to master because most dogs do not normally like walking on moving surfaces such as the teeter board. It is important that you work with your dog so eventually they begin to create muscle memory, allowing them to know exactly what parts of the board the must step on in order to not be penalized. Another useful piece of agility training equipment to have at home is the dog tunnel. Dogs barrel through this obstacle at top speeds so you will want to work with your dog to increase their speed and beat their personal best times. Buy a set of 4-6 training weave poles. The weave is probably the most difficult skill for dogs to master and takes the longest time to develop confidence and speed on. Start your dog off with short 5-10 minute practices every day. There are some great agility training DVDs which feature champion agility dog trainers who walk you through the weave and teach you how to make practice more fun for you and your dog. The main goal as a beginner is not to be perfect, it is to build confidence, learn focus and teach patience to you and your dog. The most important thing that you need to remember is that agility IS a team sport between you and your dog. Learning to work together and master these skills will give both you and your dog tremendous satisfaction! 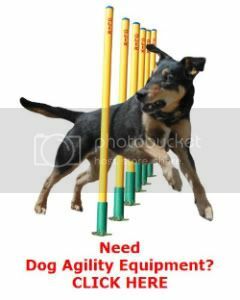 Because there are so many options out there in agility training equipment, it is easy to get confused and purchase equipment which will hurt your dogs training and end up wasting your time and money. Stick to the basics: Contact Board, Dog Tunnel, Training Weave Poles and Weave DVDs. Powered by WordPress and created by InfoKitty.